Stereotactic radiotherapy (SBRT) gives radiotherapy from many different angles around the body. The beams meet at the tumour. This means the tumour receives a high dose of radiation and the tissues around it receive a much lower dose. This lowers the risk of side effects. Usually you have between 1 and 8 treatments. Stereotactic treatment for the body is called stereotactic body radiotherapy (SBRT) or stereotactic ablative radiotherapy (SABR). You might hear the term stereotactic radiosurgery (SRS), this means stereotactic treatment to the brain. Stereotactic treatment can also treat areas that have previously been treated with radiotherapy. For example, if someone has already had radiotherapy to their pelvis they usually wouldn't be able to have radiotherapy again. But because stereotactic treatment is so precise it can often mean re-treatment is possible. Research is being carried out to see what other areas stereotactic treatment will be helpful for. Planning SBRT treatment involves several steps. You start with a session in the radiotherapy department. You have a CT scan. You may also have MRI scans or PET scans of the area of the body to be treated. The information from these scans feeds directly into the radiotherapy planning computer. The computer programme then designs radiation beams that follow the shape of the tumour very closely. Your doctor makes sure that all of the tumour is inside the radiotherapy field and healthy tissue is avoided as much as possible. This reduces the risk of side effects. The radiographers (sometimes called radiotherapists) might make marks on your skin that act as reference points to make sure every treatment session is accurate. If you are having radiotherapy to your head or neck, you may need to wear a radiotherapy mask during your treatment. You may hear this called a shell or mould. Most types of masks are made of a mesh material with lots of small holes. You can have a mould for other parts of the body, such as the breast or limbs. The mould or mask keeps the treatment area completely still, so your treatment will be as accurate as possible. Your doctor or radiographer may ask you to have small metal markers (fiducial markers) put in or near your tumour. This is common for prostate cancer. To place the markers, your doctor inserts a needle into the area of skin over the cancer. They do this while you are having an ultrasound scan. Once the tip of the needle is in the right place your doctor releases a small gold pellet or rod. Your radiographers can then see the markers on x-rays and scans while you're having treatment. They act as a marker for the treatment area, and makes sure that the treatment is very accurate. Your radiographers will take either x-rays or scans every day before treatment if you this type of metal markers. After the planning session you usually have to wait a few days or up to 2 weeks for the physicist and your radiotherapy doctor to create your treatment plan. You then get an appointment for your first session of radiotherapy. To have the treatment you lie on a radiotherapy couch. The radiographers help you to get into the right position and put on any moulds that you may need. Different machines can be used to give stereotactic radiotherapy. The most commonly used one is a Linear Accelerator (LINAC). But you might also have it on a CyberKnife machine. Once you are in the right position the staff leave you alone in the room. This is so they are not exposed to radiation. You will be alone for the treatment, which lasts between 15 minutes to 2 hours. It can sometimes last longer than this. You might have the treatment in one go or it may be broken up with short breaks. The radiographers can speak to you by intercom and they can see and hear you the whole time. It is important that you stay very still throughout the treatment. You won't feel anything and the machine doesn't touch you. The machine will beep from time to time. Once the treatment is over the radiographers come in and help you get down from the treatment couch. The CyberKnife radiotherapy machine has a robotic arm that moves around the treatment couch to give doses of radiation from different angles. The radiotherapy machine usually takes x-rays every 10 to 20 seconds. The robotic arm uses x-rays to correct its position. This allows your radiographers to target radiotherapy beams accurately at the tumour, even if the tumour moves as you breathe. Treatment may take between 30 minutes to 4 hours depending on the type of cancer and the position of the tumour in the body. CyberKnife can treat multiple tumours at the same time. So it can be very useful for areas of cancer spread. You may have the treatment in one go or it may be broken up with short breaks. Stereotactic radiotherapy targets the tumour very precisely and the risk of damage to normal surrounding tissues is low. Therefore the side effects may be less than with other types of radiotherapy. Unfortunately you can still have side effects. As with any external beam radiotherapy, the side effects only affect the part of the body that the radiotherapy treatment is aimed at. 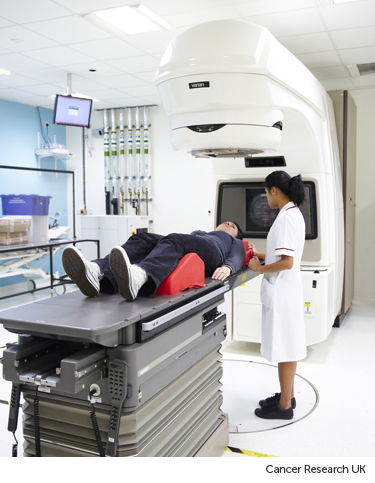 Stereotactic radiotherapy is available at many treatment centres in the UK. This includes at NHS radiotherapy units that have specialised radiotherapy machines such as CyberKnife. If you think this treatment may be right for your type of cancer ask your doctor. They can refer you to another centre if this would be an appropriate treatment for you.